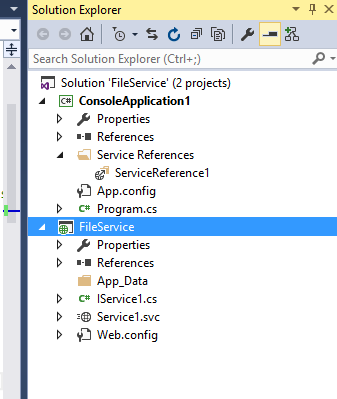 This is an interesting one – it is possible to load a binary file (such as an exe) in a .NET service and return it to the client via WCF. It’s actually not that complex either; in this example, I’ve created a basic service and console application. The important part about the above code is that the method must return a Stream, and can only accept a single parameter (you can send large data by reversing this). As you can see, although the code is a bit messy, it’s not complex, and the bulk of the code is actually turning the Stream into a file (I’m sure there’s an easier way of doing this). The config files are the key here. The encoding and transfer mode need to be changed. So, the transfer mode is streamed, and the encoding is ‘Mtom’. Make sure that the endpoint is configured against the binding (otherwise it’ll use the default binding, repeatedly moan that it’s out of memory and mismatched for no apparent reason and you’ll spend ages wondering why). The client config can be updated using the “Update Service Reference” option; however, double check what it adds. The only real thing of note in the client is the `maxReceivedMessageSize`; this has to be big enough to take your largest file. Obviously, the timeout settings matter, but maybe if you’re taking 10 minutes to transfer then you’ve got bigger problems. That’s it – it all works neatly, and looks deceptively easy! This entry was posted in C#, WCF and tagged Binary, c#, ReadByte, Service Client, Service Reference, WCF on October 16, 2015 by pcmichaels. Seriously, I’m tearing my hair out. Do you know why I get this error and you don’t? Without seeing your code it would be difficult to advise – if you post what you have then I’m happy to help. It has been a while since I wrote this article, so something in WCF may have moved on. If I get chance in the near future, I’ll revisit it and try again. If you do come across a solution then I’d love to add that to the article for any future visitors.